Will My Wife Be Disappointed Yet Again? Tammy has seen her fair share of disappointment over the past six years seven years (oops) we’ve been married, but none more so than today. I’m just glad that, for once, her disappointment wasn’t my fault. As I wrote about back in October, Tammy was VERY excited that she had been selected for jury duty. Today was the day she had to report to the courthouse. Where Tammy is hoping she will get to sit after tomorrow’s meeting at the courthouse. Earlier this afternoon, while we were watching the latest episode of CBS’s Elementary (which is actually pretty good, by the way), a little over halfway into the show Tammy let me know she had figured out who the killer was. Tammy: I already figured out who did it, and I’M not on a jury. I think it was Brandon (one of the characters in the episode). Tammy: (shakes her head) And you WERE on a jury. Me: (laughs) Yeah and that’s prolly why I was. She just couldn’t believe that she didn’t get picked or didn’t even get called in for questioning. Tammy: I can’t believe that like 90 people were called in and I wasn’t one of them. I mean, really, I bet not one person in there wanted to be on a jury more than me. She had to call in earlier tonight to see if she needed to go back to the courthouse tomorrow and was so excited when she got the news. Tammy: I have to go in tomoooorrroooow. Should I listen to it again just to make sure? Me: Or just because you want to hear it again? After she heard the message for a second time, which confirmed that she indeed had to go in tomorrow morning, she got excited again. Tammy: I LOVE me some jury!! I’m just hoping she doesn’t come home disappointed again. Gallery | This entry was posted in Daily Life and tagged court, daily life, humor, jury, legal, life, postaweek2012, relationships, Tammy. Bookmark the permalink. 6 Responses to Will My Wife Be Disappointed Yet Again? 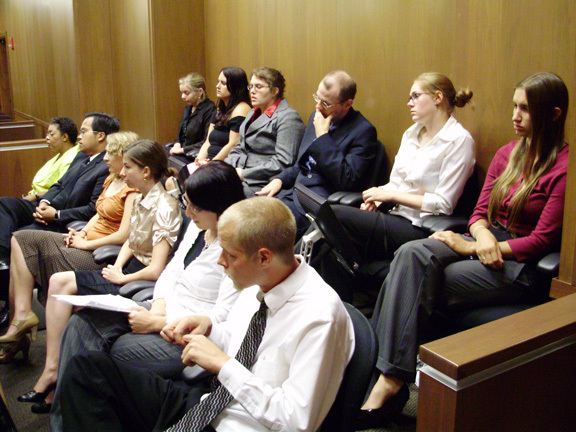 I was on Jury Duty a few years ago (when I couldn’t get out of it), and it was the two most boring weeks of my life. Two criminal cases – each one lasting two days. The rest of the time was spent sitting around doing nothing. I’ve never been to Jury Duty. In fact, I got out of it twice. Once, because I was moving and the second time, because I had a babe at home. My sister was on one once and was scared for her life. Hope your wife has better luck! I’m with your wife. Shortly after graduating college I called the local courthouse to volunteer for jury duty, mainly because I needed the per diem and thought it would be cool. Been called twice, once for state and once for federal, never selected. My wife sat on a jury in an attempted murder trial, said the attorneys for both sides zeroed in on her the second she said I was a lawyer.